Malta is at a high risk of being used for money laundering and at a “medium-high” risk of terrorist financing, a national study has found. The 2017 assessment, which had not yet been published by the government on security grounds, found Malta to be at a “high” risk of receiving foreign proceeds of crime and a “medium-high” risk of local crime. In a presentation of the results made by the authorities to financial industry stakeholders last month, tax evasion and local criminal groups were said to be the highest threat drivers of money-laundering identified by the national assessment. 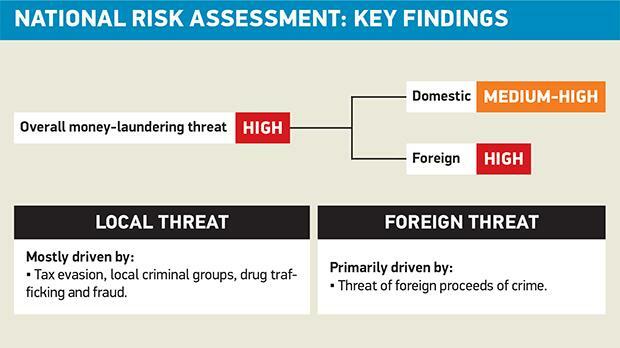 Drug trafficking, fraud, corruption and bribery were ranked as “medium-high” money-laundering threats. Tax evasion was estimated at 5% of GDP, while the OECD average was put at 3%, according to the same presentation. Revenue from the illicit market is thought to reach 1.4% of GDP, higher than the EU average of 0.9%. Industry stakeholders were told that Malta’s large financial sector was one of the biggest drivers of the island’s “high” threat from the laundering of foreign proceeds of crime. The national risk assessment said that funds generated from offences committed in high-risk nearby countries posed a high money-laundering threat to Malta. Malta’s banking sector, company service providers, lawyers and trustees as well as remote gaming were found to pose the highest risk of being used for money-laundering. The country’s overall terrorist financing threat was deemed to be “medium-high”. According to the study, the island’s geographic location exposes the country to terrorist organisations in neighbouring states. It said an influx of refugees from neighbouring countries could be exploited by terrorist organisations, leading to the possibility of terrorist organisations infiltrating the EU. Cross-border cash transactions and high levels of remittances were found to pose a threat due to the difficulty of monitoring such money flows. The risk assessment found weaknesses in controls of cash movements at sea terminals and at the airport. The results pointed out that the international Financial Action Task Force highlighted virtual currencies as one of the key emerging risks for money-laundering, terrorist-financing, tax evasion and fraud. Since the risk assessment conducted last year, the government has announced a national anti-money-laundering and terrorist-financing strategy and supporting action plan. A national coordinating committee was set up to direct and oversee the implementation of the strategy. One of the pillars of the strategy is the establishment of an effective asset recovery unit. Such a unit was established on paper in 2015 but only became operational in 2017. Replying to questions by the Times of Malta, a Finance Ministry spokesman said the action plan to implement the anti-money-laundering strategy came up with 47 tasks to specifically address every risk indicated in the national assessment. The spokesman said the results of the national risk assessment and the action plan would be made available online.